PNG Mosquitos have given themselves a chance to make the IC17 final with a superb display of athletic and skillful football tinged with aggression, unrelenting accuracy and the ability to shark the ruck contests. 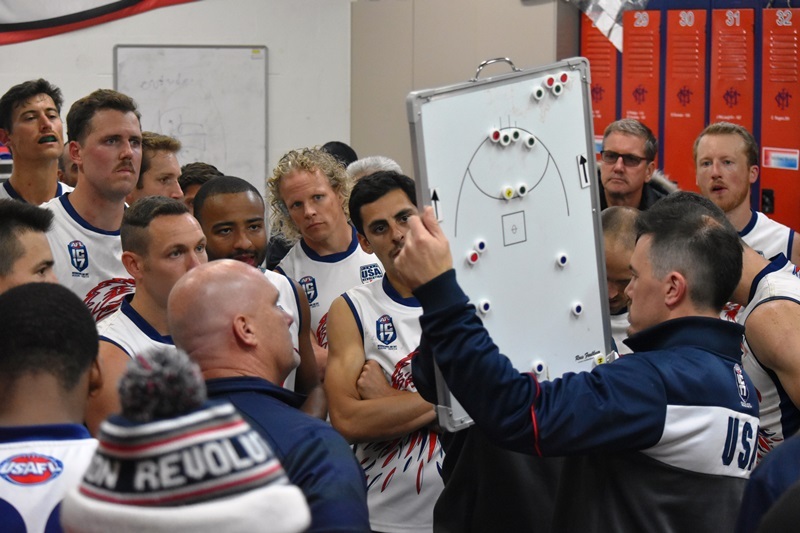 Prior to the game, the mood had swung firmly in the direction of the Revolution, who have built confidence with good wins in the first two rounds over Canada and South Africa. 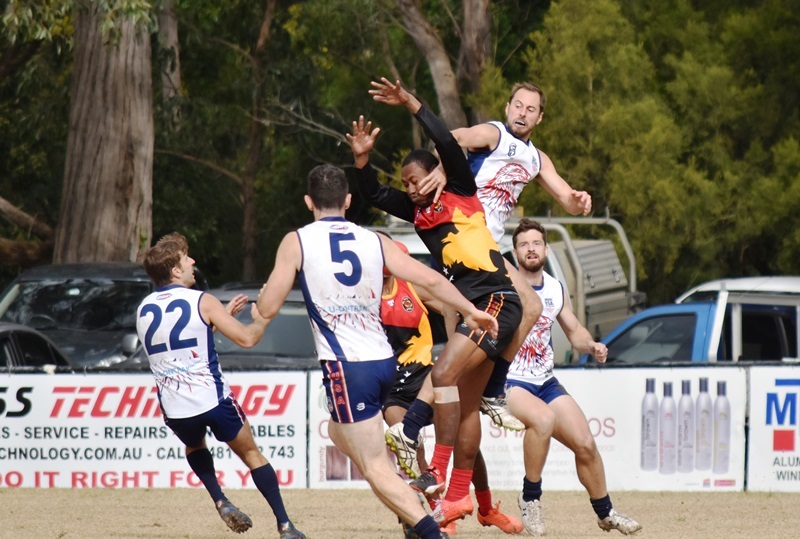 Mosquito Matt King opted to play for the Montrose Demons today instead of the P.N.G. national team, the other PNG/Montrose player JJ Peni was out due to injury. The Revolution have developed a strong relationship with the Montrose Football Club and had tr7ained with Montrose earlier this week. They knew the ground well with one player also having played previously for Montrose (Ben Carpenter-Nwanyanwu). Both the Revolution and the Mosquitos had a number of Australian-based/experienced players playing in today's match. The ground at Montrose was firm and the weather was surprisingly dry and cool with negligible wind. Any rain to come was seen to favour the Mosquitos and their more ground-based play, but this did not eventuate. U.S.A. Revolution has slipped in rankings from 4th in 2011 to 8th in 2014 mainly due to being overtaken by some emerging countries as in Tonga, R.S.A. and Canada and also due to some vagaries of the draw. The P.N.G. Mosquitos have played in all 5 International Cups winning twice in years 2008 and 2011. 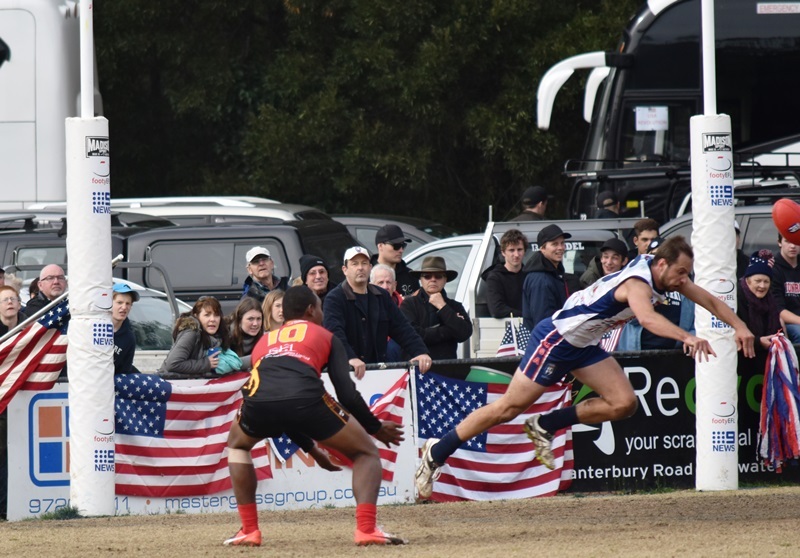 Prior to the commencement of IC17, by any measure they were the team to beat but after two rounds the U.S.A. Revolution were favourites on form. It went without saying that a win to both teams was critical. A win to the P.N.G. would probably lead to Grand Finalists being selected on percentage (depending on what happens with Ireland vs NZ on Tuesday) and a win to the U.S.A. might propel them into the grand final if they could then defeat France on Tuesday. Running onto the field the Revolution players looked bigger and robust. They received a large round of vocal support from a sizable crowd. P.N.G. performed the traditional war dance which concluded right in the face of the Americans. The first bounce set the pattern for the day with the Americans winning the ruck taps. The U.S.A. stated well with Clyde Simpson #23 goaling from the 45m arc. Jason Wilhelm #24 was producing drive around the ground. The Mosquitos rebounded with Emmaus Wartovo #12 kicking to Amua Mizza Pirika #10 for a mark and goal. Jay Levesque #17 gathered dummied and snapped true to put the Revolution back in front. The see-saw continued with Pirika #10 kicking his second goal from a free kick after being taken too high, 30m out on the angle and Luke Savere #8 goaling from a free kick for the Mosquitos. 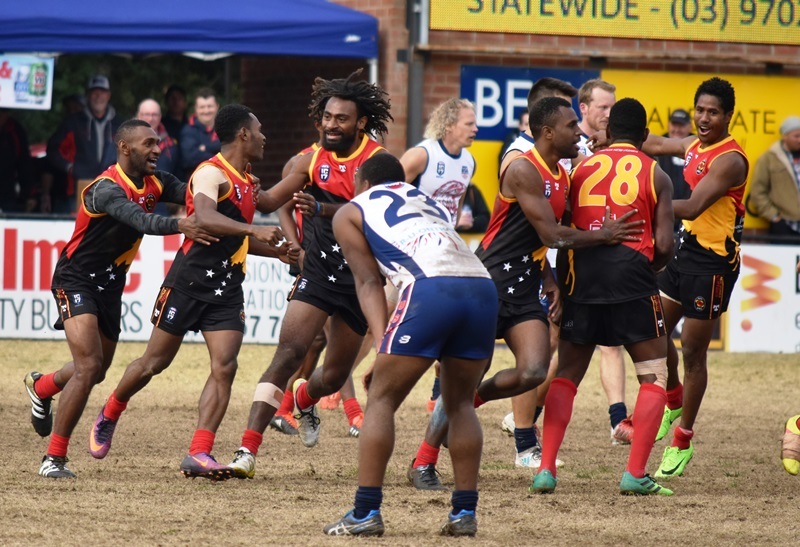 The umpires had been dynamite on the holding-the-ball decision which tends to keep the game clean but as soon as the half-time siren sounded a huge brawl erupted. 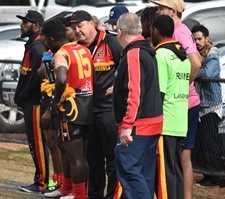 The third quarter commenced with three players sitting on the bench for 10 minutes for yellow cards received in the half-time melee (Lavail and Ikupu). Thus 16 players for the P.N.G. versus 18 players for the U.S.A took the field. The second quarter Jason Wilhelm #24 again dominating the ruck but the Mosquitos were sharking most hitouts and with quick movements forward they were generally much better at ground level. 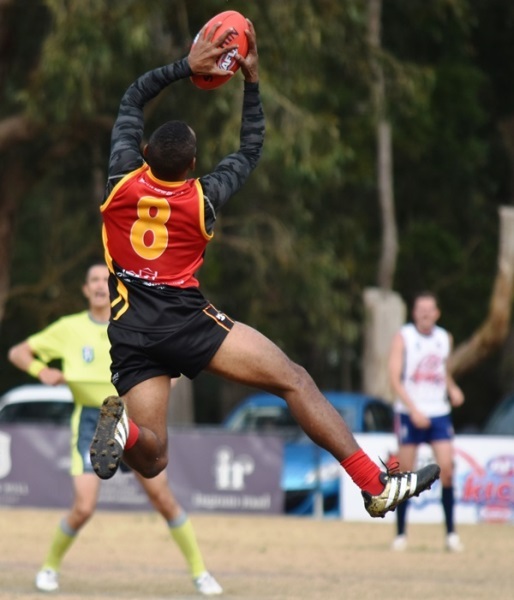 Jeffery Namete #19 was jumping high to contest the ruck but as the game went on the P.N.G. were often content not to contest the ruck and just read the hitouts.The U.S.A. were much slower and did not have much opportunity to use their height advantage. Bryan Dragus kicked the first goal for the US for the quarter after a free kick for high contact in the marking contest. Shortly after some silly play by PNG saw a mark and 25m penalty reversed and the U.S.A. rebounded with a mark and goal from Bryan Dragus #18 from 15m out to kick his second goal. Brendan Beno #15 passed to Amua Muzza Pirika #10 who goaled with the aid of 25m penalty. The Mosquitos had lifted to another level.and John Ikupu #26 was providing drive for P.N.G. whilst Bryan Dragus #18 and David Restrepo #14 were doing the same for the U.S.A.
Siwee kicked PNG's fifth goal after being interfered with in the marking contest. PNG took a good lead into half time when Hewago Paul Oea #1 goaling from an uncontested mark just forward of the arc for the Mosquitos. Jambuforo goaled benefiting from PNG's forward pressure and swooping on the ball spilled from the tackle. John Freeman #10 and Jason Wilhelm #24 were again prominent along with Hewago Paul Oea #1 and David Restrepo #14.for the P.N.G. defended tigerously and then accelerated away when the full compliment of players returned to the field. HewagoPaul Oea #1 passed to Kataha Paulias Siwee #23 for a goal and then Kataha Paulias Siwee #23 passed to Emaaus Wartovo for another goal, soccered this time. The Mosquitos were really mixing it up with long and short kicks. A kick-in to the centre circle was followed by chip kicks around the boundary. It was impossible to predict their moves. Gideon Simon #16 passed to Amua Pirika #10 on a lead for a mark and goal and shortly after added his sixth. . Thirty seconds before the siren the U.S.A finally goaled from a good snap by David Restrepo #14. Tim Lindfelt #33 moved into the ruck for the Revolution in the final quarter and directed the hitouts better but the Mosquitos were still controlling the stoppages.Hewago Paul Oea #1 was unlucky not to goal. The Revolution’s Captain Kyle Johnson #15 passed to John Freeman #10 in a rare passage of precision play for a goal. The Revolution tired a little and let players like Scott Johnson #6 produce some magnificent touches around the packs. Oea added a goal for PNG, roving the back of the pack and kicking it from point-blank range. Again the P.N.G. players sharked the ruck and ran through the packs dodging and weaving like American gridiron players. Alphonse Jambarufo #28 was everywhere and also Hewago Paul Oea #1. Pirika roved the pack and snapped true for a goal and Jambuforo followed up with another goal after a pass from Paul Phillip #24. P.N.G. finished with a goal to Gideon Simon #16 from the arc into an unguarded goal. Scott Johnson snapped truly for the final PNG goal for the match. Two late goals to Kyle Johnson and Freeman for the US might ultimately be handy if the Grand Final race comes down to percentage, but for this game was a little too late. It was a superb display of football from the P.N.G. team that became more dominant the further the game progressed. They dominated the stoppages by reading the play and later in the game the bigger players busted the packs wide open whilst the smaller players simply ran around the opposition. It cannot be overstated the skills of the Mosquitos that they possess registering only two behinds for the match with one shot being just touched on the line. Such accuracy made the job easier for the P.N.G. The win today has thrown open the race for grand final positions and built even more interest in following games. On this game’s effort, the P.N.G. are back in contention and that will worry the Northern Hemisphere sides a lot. Talking to the locals at Montrose they were thoroughly entertained and impressed by the quality of the International clash whilst both international clubs appreciate the facilities at Montrose.